Which struck me, because in the few days before I’d run across a number of reviews online, all of which were of one mind with praise. Then, a few days later, I happened to run into some other pals, Mike and Wendy, film and TV buffs with good taste. When I asked if they’d watched “Killing Eve,” they immediately came with the compliments. So I went home and streamed the first episode of the eight part series that has completed its first season cable run. Hooked, I watched another. Being somewhat compulsive, then another. Consumed two more the following rainy afternoon. Then the final three episodes that night. Love when something like this lures me into the power binge. 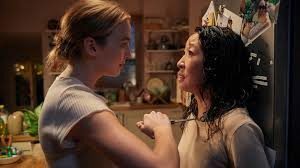 Sandra Oh portrays a British MI5 agent obsessed with female serial killers. Jodie Comer plays a contract killer for a secret international cabal. Or, so we’re led to believe. Hunter vs. the Hunted. And then the vice versa. Obviously I was and remain fascinated — there will be a Season 2.